Africa bears the heaviest burden of disease mainly due to communicable diseases especially HIV/AIDS, Malaria and Tuberculosis, as well as high child and maternal mortality, some of which are preventable. Non-communicable diseases, such as high-blood pressure, heart disease, diabetes and mental illness are also emerging as contributors to the healthcare burden. This greatly impacts on the continent’s resources: Whereas Africa carries the highest burden of diseases and therefore needs to have health systems which can cope effectively with controlling the disease burden, the financial resources needed for that to happen has not been available or adequate. Unfortunately, allopathic infrastructure is costly and often only deals with health problems after they have manifested. 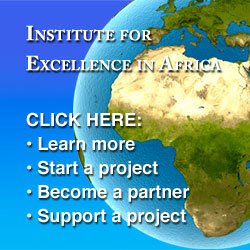 The Institute for Excellence in Africa promotes a new inexpensive natural approach to healthcare which focuses on preventing sickness and disease at their source.